Do the Black Panthers know Stacey Abrams wants to confiscate their guns? Lies and intimidation are key to Democrat victories. Photos of several armed members of the Black Pathers made the rounds on social media on Sunday. 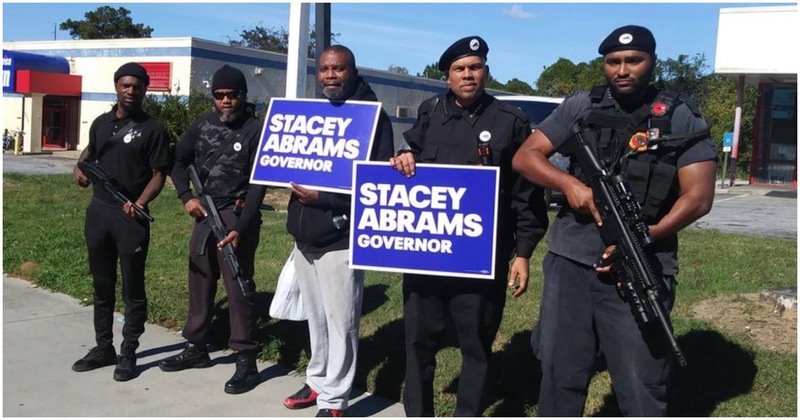 Abrams’ opponent, Brian Kemp, shared one image showing several men, some holding Stacey Abrams signs and others holding rifles. Do these Black Panthers know Abrams wants to confiscate their guns? Will Abrams condemn the Black Panthers for carrying? Not only did Abrams say a “blue wave” in November will consist of illegal aliens, but an unearthed report shows Abrams setting the Georgia flag ablaze during a protest in her youth (MORE ON THAT BELOW). Vice President Mike Pence has a few words for billionaire liberal Oprah Winfrey, who recently campaigned for Abrams. Oprah Winfrey, the coastal elite billionaire and queen of all media, went down to Georgia to stump for Democrats. In a Thursday speech delivered before a town hall, Winfrey praised gubernatorial candidate Stacey Abrams and advised people to honor their ancestors by exercising their right to vote. A decades-old news article about Georgia gubernatorial candidate Stacey Abrams (D) burning the state flag, which at the time included the Confederate battle flag, resurfaced on Monday.